German artist Thorsten Brinkmann describes his Rice Gallery installation, The Great Cape Rinderhorn as a “decaying palace.” Overwhelming at first glance, this “palace” is full of idiosyncratic and eccentric opulence. The walls are painted in angled swatches of pea green, teal, brown, and deep purple interrupting densely patterned pink wallpaper. Lining these walls are portraits of figures in the kind of regal poses traditionally reserved for richly attired knights and monarchs. Here, however, their bodies and faces are adorned and disguised by common objects (trashcans, lampshades, tattered blankets, and ski gloves) and not the precious materials that normally signify royalty. At the center of the gallery sits a plywood crate with a huge animal horn inexplicably perched atop it. 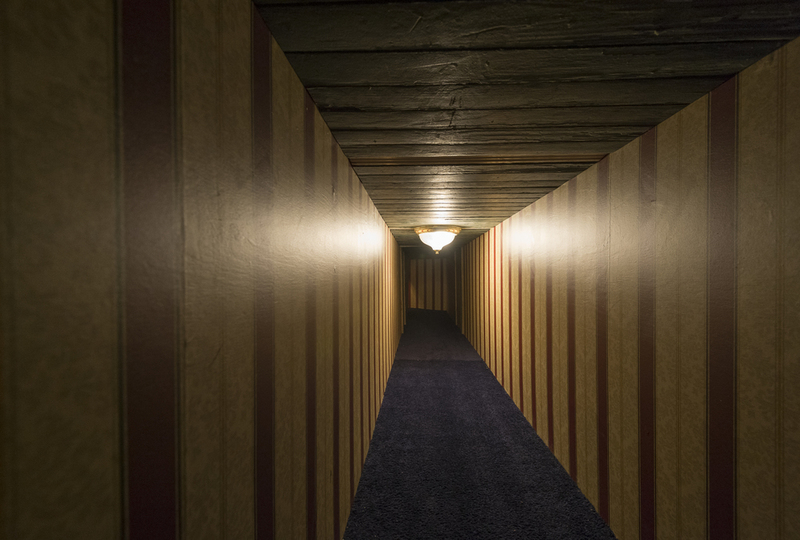 A small opening in the side of the crate allows visitors entry to a hidden “cinema,” where a video shows a hapless king struggling to find the right pose, and a tunnel leads to the palace inhabitant’s secret room. A self-proclaimed serialsammler (“serial collector”), Thorsten Brinkmann keeps whatever catches his eye as he sifts through the broken and discarded items sitting in purgatory on thrift store shelves. Brinkmann incorporates his finds into photographs, which he then combines with the found objects to create his room-sized installations. In his Portraits of a Serialsammler series, Brinkmann photographs himself wearing his creative ensembles of fabric-scrap vests, pleated skirts for capes, and trashcan helmets. In keeping with his affinity for concealment and surprise, he never shows his face. The images marry the traditional and absurd as his poses draw from centuries of Western painting conventions of old master portraiture. For example, a reclining figure may bring to mind Titian’s Venus of Urbino (1538), but Brinkmann never aims to replicate the exact painting. In another series, studiobluten (“studio blossoms”), he arranges the secondhand objects into elegant still lifes that mine painting traditions like Dutch Vanitas. Weathered paint cans, chipped vases, a bicycle chain, and miscellaneous bric-a-brac are given a fresh life through playful recombination and reframing. One way to experience art is to stand in front of it. You can walk around a sculpture, but you are mostly using your eyes. In an installation, you really use your whole body and all your senses. In this installation, you can even bend down and crawl. There are old objects and materials, so there’s a certain smell. You can touch things. You are completely surrounded in an atmosphere and you become part of it. Thorsten Brinkmann was born in Herne, Germany in 1971. He studied Visual Communication at Kunsthochschule Kassel and Fine Arts at Hochschule für Bildende Künste, Hamburg. Brinkmann is known internationally for his unconventional photographic portraits and still lifes, featured recently in T: The New York Times Style Magazine article, “Witty Photos That Play With Centuries-Old Artistic Tradition” (September 2015). In 2011, Thorsten Brinkmann received the Finkenwerder Art Prize, “awarded to artists who have made an extraordinary contribution to contemporary art in Germany.” He lives and works in Hamburg.